In For your eyes only 1981, Bond meets with Kristatos at the Corfu casino. After a game of Chemin de fer (Baccarat) where Bond wins a few hundred thousand Drachma from the sweating Lord Bunky, Bond and Kristatos have dinner at the casino restaurant. 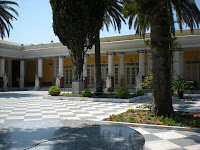 Theses scenes were filmed at what was then the real Corfu casino, housed in the Achilleion Palace in Gastouri. The Achiellon Palace was built in 1890 by the Empress of Austria, Elisabeth of Bavaria. It was originally built as a summer recidence, designed with the hero Achilles as its central theme. Several statues of Achilles can be found in the palace garden. Elisabeth visited the palace until her passing in Geneva 1898. After her death, the German Kaiser Wilhelm II purchased Achilleon in 1907 and used it as a summer residence. During this time a lot of diplomatic activity took place in Achilleon and it became a hub of European diplomacy. The restaurant scene was filmed at the back of the Palace. The locations has not changed much and you can still recognize the black and white tiles covering the back of the palace. The small statues filmed in the foreground are still here. 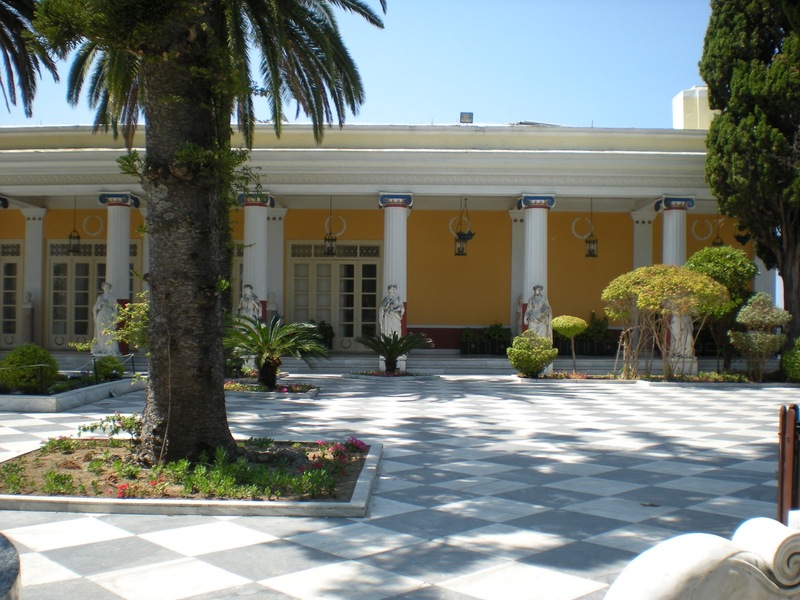 In the lower part of the garden, two large statues of Achilles can be found, in accordance with the palace theme. Kaiser Wilhelm visited the palace until 1914 and the beginning of World War I. During the war the palace was used as a military hospital and after the war it became the propery of the Greek state according to the treaty of Versailles. It was then used to house various government services and during World War II the axis powers used the palace as military headquarters. In 1962 the palace was leased to a private company that converted the upper level to a casino and the ground floor to a museum. The lease was terminated in 1983 and the property was returned to the Hellenic tourist organisation. Thus, only a few years after the film, the casino closed down. -Ena ouzo, ena whisky jorispago parakalo!" Bond orders an ouzo and Kristatos orders a whisky and specifies "no ice". Behind Bond and the head waiter you can see the large statues in front of the pillars still in place. On the other side of the courtyard you can sit and enjoy this wonderful location and you should really take your time. 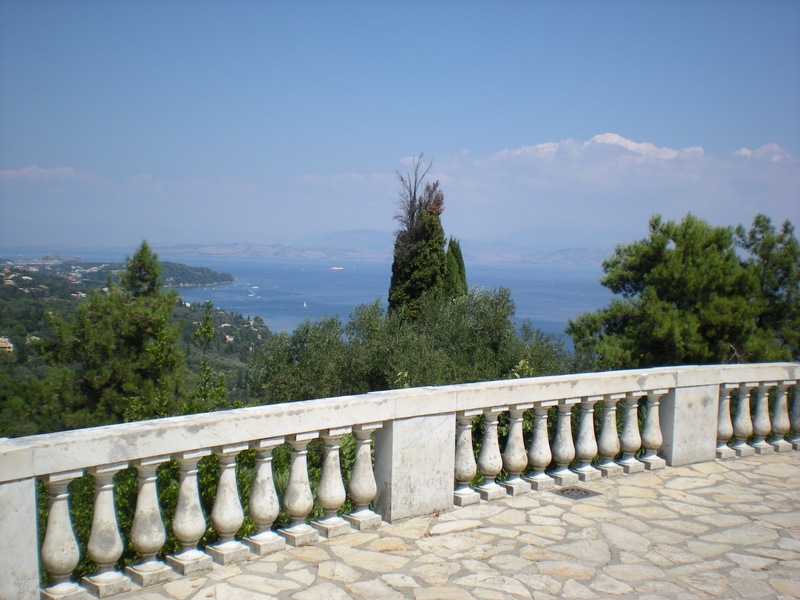 The Achilleion Palace has a spectacular view over the coast. It is sad that the casino has moved to the Corfu Hilton and that the guests from the restaurant are gone. This would probably be one of the best places in the world for a restaurant. I can see why. Was Corfu your home?" Another beautiful location from the movie can also be found here. In the garden at the back of the Palace, you can find the view point where Melina becomes emotional when talking to Bond about her dead parents. From here you have a view over Corfu town and the coast. Unfortunately the palace and the garden is popular by tourists so you can't count on spending time here alone. 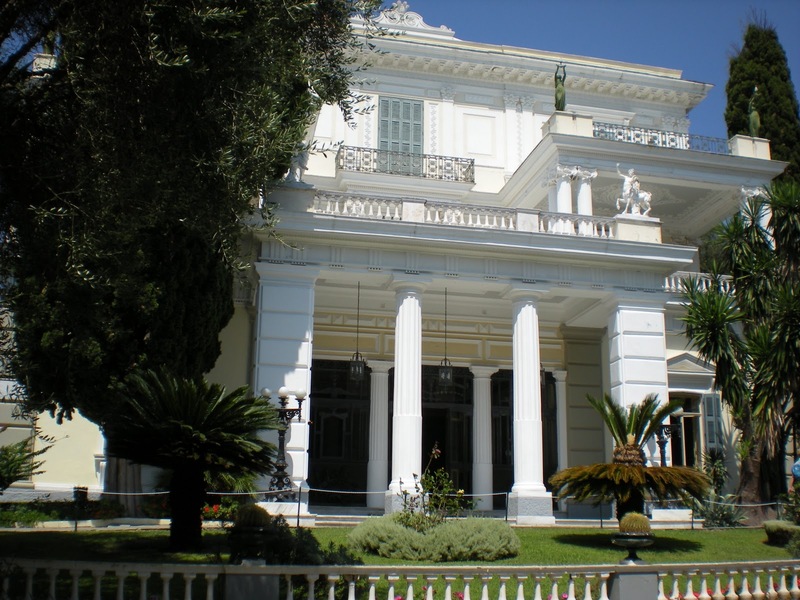 In the film this scene is not supposed to take place at the Achilleon palace but in Corfu town, since Bond and Melina are walking thru the centre of the town, ending up here. You get the feeling that this is located in the town centre, but is is easy to understand why the filmmakers wanted to use this location since it is the best view point on the island. Over the water you can see the Albanian coast. I was lucky to be there with my love 1989. We were at the Casino and then we went out at the balcony later in the evening. Very romantic and most beautiful memories from Corfu. Lovely party! Yes it is truly one of the best places in Corfu. I think the casino closed down in the mid 90's and I've always thought that the restaurant at the back of the palace didn't exist. But was there also a restaurant in 1989?